Readers of Country Gardener magazine now have even more reason to want to get their hands on a copy and that’s to be part of our £10,000 Thompson & Morgan Seed Giveaway! 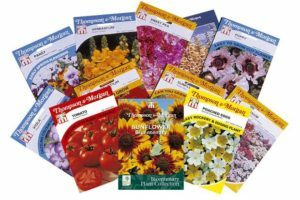 The April and May issues of the magazine contain a coupon giving readers who buy tickets to Toby’s Garden Festival on Saturday 29th April the chance to claim £10 worth of Thompson& Morgan flower and vegetable seeds* for FREE! The first 1,000 visitors who bring along a coupon from the April or May editions of Country Gardener magazine can claim the seeds. We are setting up a special ‘Seedy Saturday’ desk outside the Tea Tent on the Lower Lawn at the Festival where you can collect your seeds. Country Gardener is available from a wide selection of garden centres, farm shops, nurseries and information centres throughout the south west. Please note the picture may differ from the seeds in the Seedy Saturday Giveaway. Terms & Conditions: The offer is available only to those who have purchased a ticket to Toby Buckland Garden Festival for Saturday 29th April 2017. One pack per coupon, photocopies not accepted. The offer is strictly Saturday only and not available for the Friday. Seeds available on a first come first served basis while stocks last. could you tell me what time Adam Frost has his slot on Saturday pleae? Hi Lisa, Adam Frost is in the Speakers’ Marquee at 11am on Saturday. Thanks.